Home » Greenroom » Wondering What to Do With Your Old Computer? Recycle It! Wondering What to Do With Your Old Computer? Recycle It! It is inevitable that your office will want to update its computers and other office equipment every few years. It can’t be helped, what with the speed with which new technology comes onto the market and existing technology is tagged as obsolete. At Alsco, we know only too well how quickly state-of-the-art can become old-school, but we also know how environmentally meaningful it is to recycle computers, and not simply throw them away. In Australia, the battle to divert the vast majority of e-waste from landfills has already begun in earnest, with the introduction of a new National Television and Computer Recycling Scheme. And federal government figures explain why. In 2008, Australians purchased a total of 138,000 tonnes of televisions, computers and computer products, with some 106,000 disposed of. However, an estimated 85% of those ended up in landfills and just 10% at recyclers. That is hardly good news for the environment, with e-waste containing hazardous metals like cadmium, mercury, and lead, and plenty of recyclable materials, like plastic, steel, iron and copper. And with a total of 44 million computers and associated equipment (weighing around 181,000 tonnes) expected to become obsolete by 2028, the strain on the environment will only increase. The new scheme is a stewardship scheme, with manufacturers and importers responsible for ensuring their products are collected. These companies are required to sign up to appointed collection contractors (DHL Supply Chain and the Australia and New Zealand Recycling Platform [ANZRP] have already been confirmed). So, small businesses and even private residents can have their e-waste collected at no extra cost. The scheme aims to increase the e-waste recycling rate from 17% in 2010 to 80% by 2021. You can contact your local authority, local recycling company or even your own computer and office equipment suppliers, and arrange to have your e-waste collected. You can also ask for details of the new scheme.Independent e-waste recycling companies already exist, while some major computer and office equipment manufacturers already play an active role in e-waste recycling efforts. Dell, for example, have a global environmental policy that includes a dedicated recycling service in practically every country they have a presence in. You can also find a local independent PC firm that refurbishes used computers and sells them on to the public at lower prices. They will send the parts left over or unusable to recyclers. Your own suppliers may have just such a service, but if they don’t they should know who does. Of course, regulations and practices can vary from state to state and from city to city. So, it is always a good idea to speak to your state’s environmental department or your local government environment officer to find out the specific options. Charity organisations have been cashing in on old office and home technologies for quite some time now, selling your e-waste to recyclers to raise funds for their national, local and international activities. But there are also charities that are happy to take old computers that still work well to supply them to places like schools, orphanages and community facilities. 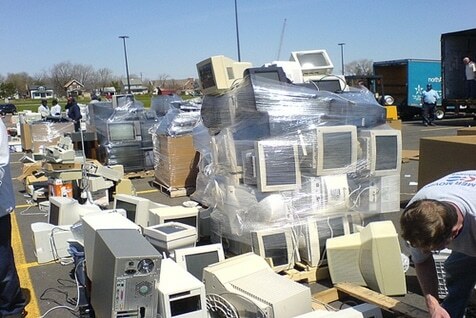 The idea is that places with no budget for technological investment can benefit from the unwanted computers that businesses and homeowners would otherwise throw out. While a lot of inroads have been made in improving the rate of recycling in domestic, commercial and industrial waste, vastly reducing the amount of e-waste heading to landfills is now a key target. The new initiative means that recycling office computers and associated IT equipment is now made simple and cost free. And that is good news for you and your business, as well as the environment. Recycling is one of the best way to share to without spending. With Alsco we offer variety of solutions to help make your workplace a greener environment and be able to save and recycle. Our Alsco Ecosafe Washers are water based and exists in its own environment where oil and grease are transformed into water and carbon dioxide. The revolutionary Evolution Mats are made from recycled eco-friendly materials. And our continuous Cloth Towel also offers important benefits with less impact in the environment. Use cotton towels which are an environmentally friendlier option than paper. If safe and healthy environment is what you want, all you need to do is ask Alsco.